Key to all Krofta DAF systems is the Krofta Air Dissolving Tube (ADT ). 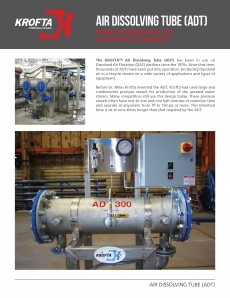 By eliminating the need for large volumes of air and water used by typical pressure components, the ADT uses air dispersion technology and centrifugal force for more efficient saturation. In operation at thousands of installations worldwide, the Krofta ADT is a central component to all Krofta DAF solutions and can be retrofitted with any existing DAF system. One of the essential features of the ADT is dissolving air into the water faster than other systems. The unique, proprietary design of the ADT results in lower retention time of only 8 to 12 seconds. The flow pattern additionally creates a vortex, which eliminates undissolved air, creating better overall performance. air in the tube, the ADT system can generate 10 – 70 micron bubbles well suited for DAF operation.